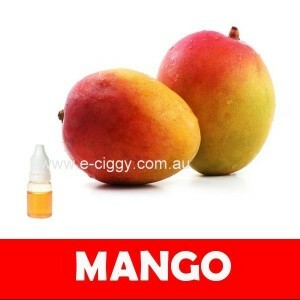 The mango e-juice amalgamation is rich in its sweetness. The sweet explosions of mango flavours in your mouth will remind you of your childhood days when the natural sugar flavours of mangoes was the one thing you wanted. The rich yellow mango e-juice will entice your taste buds until the time the flavour fuses completely with your senses and makes you enjoy the real taste. • Vegetable Glycerin (VG): VG is a sweet, thick liquid responsible for producing heavy clouds of vapour and imparting an inherent sweetness to your e-liquid. It does not have an intense flavour on its own and has a limited shelf life. • Propylene Glycol (PG): PG, on the other hand, is responsible for adding the throat hit to your e-cigarette. It generates fewer vapours, but has a very distinct flavour. It is user friendly, has a longer shelf life and is responsible for recreating a close to conventional smoking experience in your electronic device. However, it is also known to trigger allergies and skin rashes in certain users. Which is a Better Alternative? While VG provides your intense vapours, PG is responsible for generating a throat hit, therefore, it is hard to pick one over the other and generalize as to which is a more viable alternative. Choosing one over the other or using a combination of the two key components is a matter of personal taste and choice. If you would much rather have a thick cloud of vapour and do not care so much about the throat hit, you can go for a purely VG-based e-liquid or vice-versa if you want to feel the throat hit. Both components are used in a variety of food products, and are thus considered fit for human consumption, so you do not have to really worry about any side effects from the electronic counterpart of the conventional cigarette. PG is sometimes known to trigger allergies in some users. In the event of a user being allergic to PG, that individual would have no choice but to resort to VG-based e-cigs alone. Those allergic to PG can rely on elements like Diacetyl for the throat hit. Comment : Tastes so good. Feel like I'm in the tropics. Wish the weather were better. Comment : A sweet and slightly exotic flavor. Makes me want a pina colada!